About eight o'clock in the evening of Monday January the 31st 1916, the people of Loughborough were startled and amazed by a succession of loud explosions. During the winter months there had been talk of air raids in the eastern counties, but none had previously come so far inland to Leicestershire. Warnings had been given by the police when air raids had been heard on the coast, and on the evening of the 31st, an hour or so before the fateful visit, the police had warned tradesman and others that a raid was in progress. No apparent notice, however, was taken, our insular position being considered one of safety. Lights were consequently in full blaze, especially at the Ashby Road picture house and from some skylights at the Empress Works, whilst the town lamps were lit as usual. The result was that an airship travelling in the sky overhead, whilst it missed Leicester where lights had been extinguished, was attracted to Loughborough. 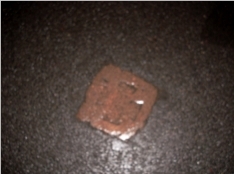 A stone sett marked with a cross, located in the middle of the road in The Rushes, Loughborough, shows where the bomb fell. The first bomb dropped in the garden behind Orchard Street. Another quickly followed in the Rushes in the centre of one of the widest thoroughfares in the town, and at almost equal distance from the Gas Works and the Electricity Station. The two explosions placed beyond doubt the cause of the noise, and where possible lights were put out. The disastrous nature of the explosion can be understood when from the one in the Rushes the glass of a gas lamp near the Echo office was broken. From the Playhouse down Ashby Road to Derby Square broken glass was met with on the footpath. Students at the Technical Institute found glass from the shattered windows falling onto their desks. From here the raiders passed to the Empress Works where two bombs were dropped, one falling near the recreation ground, the other missing the works by a few yards, but causing much of the glass roof to fall. In Judges Street, which was between the two, every window in the street was broken. Looking back at the devastation, and comparing it with raids in the Birmingham district that evening, and in other parts later, the marvel is that no greater damage was done. That the two public lighting works should have been so near and yet escape, that the last bomb should have been only a matter of a few yards from shattering the Empress Works, these were marvellous escapes. Personal memories of the event are varied according to position and temperament. No one seems to have seen the Zeppelin but the sound of its engines in the quiet star-lit night with no moon was only too pronounced once their significance became clear. Within five minutes the airship was pulsating over the Forest on the way to Burton-on-Trent, which suffered very badly, and the sound of the engines was so near the ground that one observer said he could have reached the airship with a shot from a gun. Most of the people in Loughborough treated it philosophically; others of a nervous temperament trekked along the canal to the meadows and camped there for the night. Others more humane in their actions, met at the hospital, where soon the doctors were busy attending to the wounded as they were brought in. What was known as "The Brush Guard" had started to take nightly duty in the autumn and these men were at their post. Others of the Voluntary Training Corps soon reported themselves at the police station, and with other willing helpers, gave assistance to the wounded cases on the way to the hospital. A bronze plaque was erected to the memory of the victims in January 2016, 100 years after the bombing. 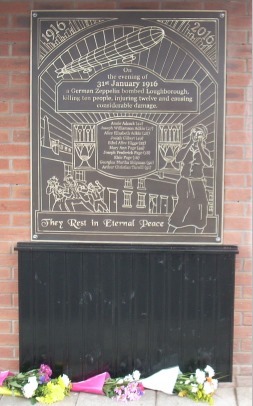 The plaque was located in The Rushes, meters from the original stone memorial (above) and was paid for by public subscription. Ten people were killed and twelve were injured. Most of those injured were taken to the Loughborough Hospital, whilst one, a tramp, was removed to the Workhouse Infirmary. The following is a complete list of the killed and injured. Annie Adcock, aged 42 years, 13 The Rushes, wife of a brush maker, five children. Joseph Williamson Adkin, aged 27, fitter, Knighthorpe Road. Alice Elizabeth Adkin, aged 28, wife of above. Josiah Gilbert, aged 49 years, shopkeeper, Empress Road, left widow and one son, 14 years. Ethel Alice Higgs, aged 25, factory hand, 104 Station Street, daughter of a labourer working at Messengers, Ltd.
Mary Anne Page, aged 44, married woman, 87 Empress Road, husband a soldier in the R.A.M.C. Joseph Frederick Page, aged 18, son of above. Elsie Page, aged 16, daughter of above. Georgina Martha Shipman, aged 50 years, 5 Orchard Street. Arthur Christian Turnill aged 51 years, fitter, 83 Station Street. Had been married twice, four children by first wife and seven children by second wife. Mary Elizabeth Askew, aged 32 years, 116 Paget Street, taken to hospital. Rose Bartholomuch, aged 38 years, an Italian ice cream vendor, living in the Rushes. Albert Edward Bowler aged 34, haberdasher, 34 Arthur Street. This man, who was organist at Woodgate Chapel, was very badly injured, receiving six wounds. David Howard Giles, aged 29, electrician, 84 Meadow Lane, wife and one child, employed at Empress Works. Venis Hunt, aged 48 years, Charles Street, married with two children. He was a soldier employed at the Empress Works. Taken to the hospital with fractured leg. William Humber, aged 33 years, iron turner, 41 Rutland Street, married, employed at Empress Works. Louie B. Kirkman, single, 34 Station Street. Percy Measures, aged 22 years, single, machine hand, 78 Meadow Lane, employed at Empress Works. Sarah Oram, wife of William Oram, licensee of the Crown and Cushion Inn, Ashby Square. James Stenson, aged 45 years, labourer, taken to the infirmary. This man, with his wife and child, came to Loughborough on the night of the raid, and stayed at Gray's Lodging House, the Rushes, where he received his injuries. John Thomas, 24 Thomas Street, married, a soldier, employed at Empress Works. Ann Elizabeth Wells, aged 42, widow with six children, 75 Wellington Street. Surrounding the casualties were some pitiful experiences. Mr. and Mrs. Atkin, of Knighthorpe Road, had not been married many weeks and she was on the way to meet him from work, both meeting near the ill-fated spot. Mrs. Adcock had come to the front door to see what the noise was about and three if not four deaths near the Empress Works were due to that curious spirit. Mr. Turnill was killed by the fall of the glass from the roof of the Empress Works. Immediately the results of the visitation became known, a relief fund was started by the Mayor, and over £500 was subscribed. Of this sum £81 5s was disbursed in paying the funeral expenses of victims, and £113 1s. 3d. was given as relief or as allowance for wages, while compensation given for damage to furniture, stores, etc., was paid to the extent of £255 4s. No compensation was given out of this fund to the landlords of property damaged by the raid. Mr. C. H. Adams acted as honorary secretary to the fund.